The meeting began in lively fashion, with members of Croydon Citadel Singing Company racing down the aisle, cheering and waving flags. 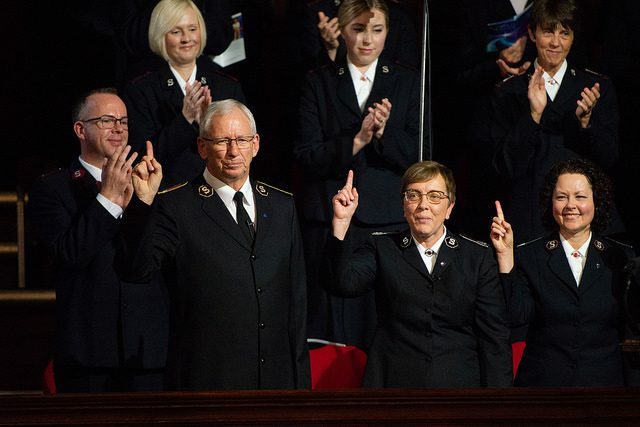 They were followed by International Headquarters flag-bearers and then—to clapping and cheers from the congregation—Chief of the Staff Commissioner Lyndon Buckingham and Commissioner Bronwyn Buckingham, World Secretary for Women’s Ministries, marched in. Finally, the Peddles marched to the front, greeted by prolonged applause. The Chief of the Staff acknowledged the presence of previous international leaders, along with territorial leaders who had gathered for the upcoming General’s Consultative Council, and welcomed the people from many countries watching online. “We are united around the globe because of our love of Jesus,” he said. 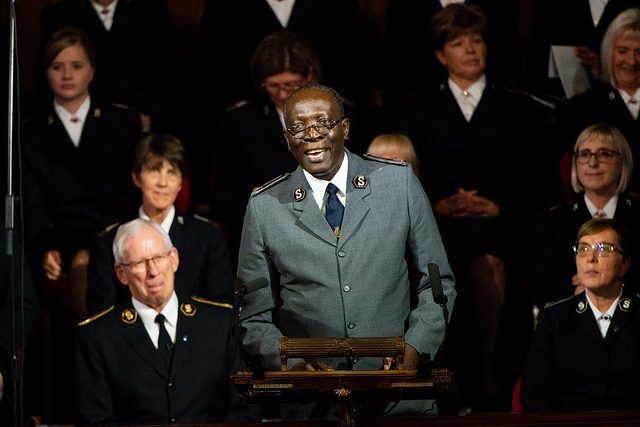 Regent Hall Band’s “Fill the World with Glory” was followed by a Scripture reading by Fredah Mfundisi—a fellow soldier of the international leaders at Southwark Corps. A lively version of “Jesus, be a Fence” by Croydon Citadel Singing Company was accompanied by images of young people’s music groups from around the world. After the ISS created a worshipful atmosphere through “In the Name of the Lord,” Rosalie Peddle responded to the words of welcome. She began with a public thanks for the huge number of cards and emails she and the General had received since his election. 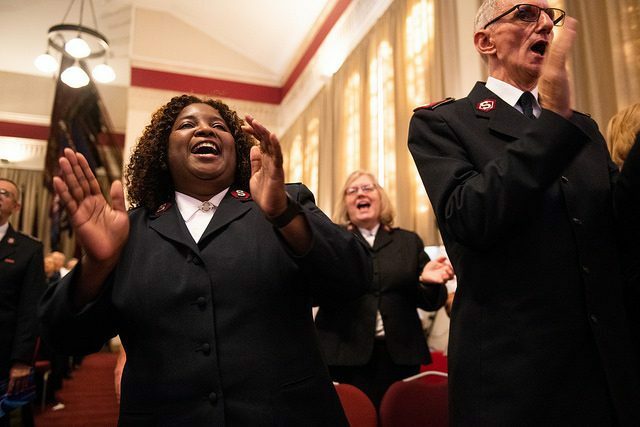 Referring to her role as World President of Women’s Ministries—or “The Salvation Army’s mother” as she has been called—the commissioner spoke of the huge challenges faced by women and girls around the world. 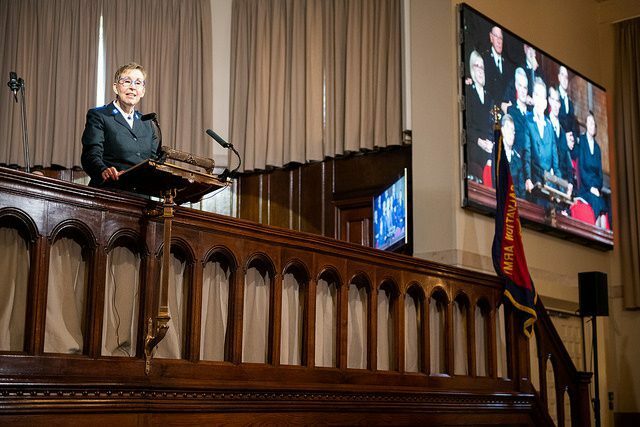 Peddle spoke with great affection about her and the General’s support from and love for their family, so it was appropriate that her words were followed by a song—“He Leadeth Me”—presented by their daughters, Captain Krista Andrews and Stephanie Forystek. 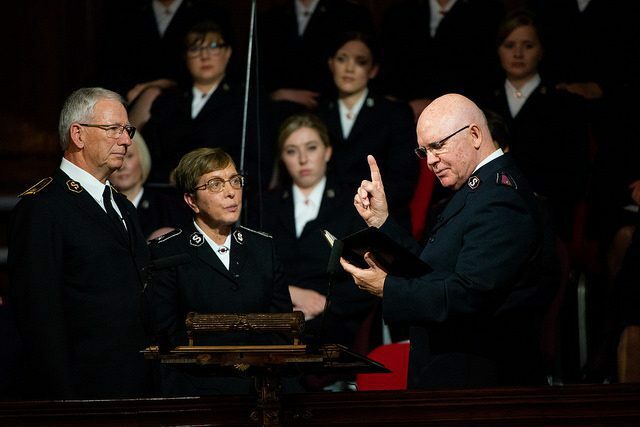 The General began his Bible message by asserting his certainty that God’s blessing is on The Salvation Army. He added to his two beliefs: that the world needs The Salvation Army and that the world deserves a Spirit-filled Salvation Army. 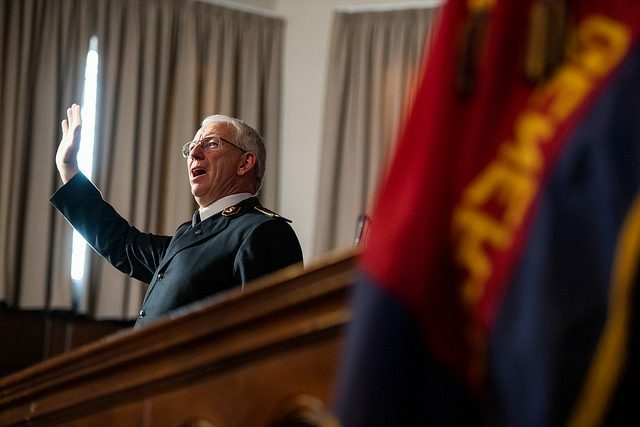 Calling people to serve, he explained: “We are not a reserve Army!” He called people to worship, to invite people to Jesus and to be confident in the gospel. The meeting finished with the rousing singing of “Storm the Forts of Darkness” before attendees made their way out to share refreshments and a time of fellowship with the international leaders.